Here is the Spring 2018 issue of Abilities Digest, volume 5, number 2. It will be distributed to email subscribers in the next few days. 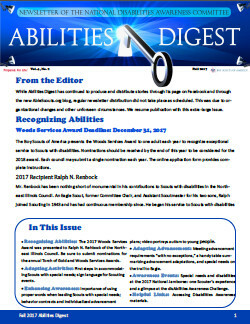 Here is a link to the latest edition of Abilities Digest. We have been having difficulties with Abilities Digest distribution. The Fall issue is extra large to accommodate materials intended to be published earlier this year.